An eighteen dish feast at Wagaya, the super terrific happy fun Japanese 'touch screen' restaurant in Haymarket\Chinatown. We are off to Japan soon for an eating fest, what better way to warm up our gluttony glands than with an 18 dish feast at Wagaya? Tonight we are joined by evil genius, Davatronics and his fiendish nubile assistant, Miss Von Trapp. 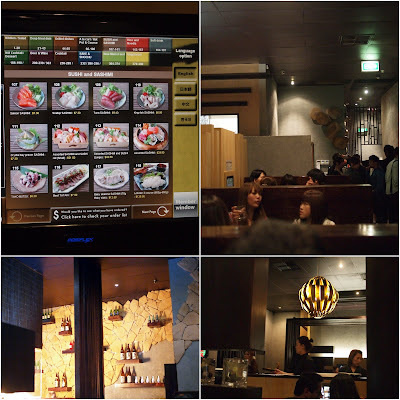 Like most Wagaya first-timers we are lured in by the novelty of ordering by touch screen. It's a ton of fun and we quickly found the touch screen is much more than a gimmick. Ordering by computer means you can order in dribs and drabs without feeling like you are harassing the wait staff. Sit back and take your time with a few bevvies and have fun finding those hidden gems on the menu, ordering what suits your stomach when you feel like it. The touch screen also halves the work of the wait staff so the service is lightning fast. Edamame $5.20. Salted soy beans, the world's finest beer snack. Agadashi tofu - $5.80. Fried silken tofu, another favourite. Octopus Balls - $5.20. I'm not usually a fan of octopus balls, even in Japan, but these won me over. Pickled Cucumber with Miso Paste - $4.10. Steamed Chicken with Green Onion - $7.20. The chicken was good but the bean sprouts were sensational. Home Made Gyoza - $6.50. These arrived sizzling on the plate and were a cut above your average gyoza. The wrappers weren't too thick and the filling generous. Get them off quick or they stick! Lightly grilled Kingfish Sushi $10.80. The kingfish sashimi is ever so slightly seared, it's shown a picture of a hot pan, just the way we love it. Yakitori $5.40 x 2. Davatronix was over the moon with this one. Wafu Pizza - $9.90. DonnaChang and Davatronics protested but Ms Von Trapp and I insisted we order this. I have an obsession with Asian versions of western food. The pizza was surprisingly good - uber cheesy with rice cake, mushrooms and chicken. One slice was enough for my arteries. Renkon chips - $5.90. Deep fried lotus root which has a taste and texture somewhere between potato and parsnip. Not content with the novelty of touch screen ordering we also had to try sake with gold flakes. $44 per 750ml bottle. Sea Urchin Sushi - $9.90. The taste and texture of the sea urchin blew my little mind, my favourite dish of the night. Octopus sashimi - $6.20 - best sashimi of the evening as voted by all. Salmon sashimi - $7.30. I must say we have had better. One theory was it could have been ocean trout. Two of my favourite words in one mouthful - scallop sashimi - $7.30. Less than a dollar a scallop! Octopus Chijimi $7.90 - a Korean style pancake. Dragon roll - $10.50. This one we spotted on another diner's table and just had to try. Sushi with cream cheese (yes, cream cheese) and avocado topped with eel and crispy fried lotus root chips. Yum. Grilled Ox Tougue. Chewy and very salty but tasty, almost like thick bacon. Cold chicken ramen $9.90. A surprise hit for the evening, the noodles were particularly flavoursome, possibly cooked in some stock, topped with steamed chicken and salad. A discussion in ensues on the virtues of cold noodle dishes, delicious yet they have never caught on in Australia. Wagaya Menu - Click to Enlarge. It's all fun and games until someone loses an eye. Or a dictionary. Wagaya is at Level 1, 78-86 Harbour St Haymarket\Chinatown. Across the road from McDonalds\Entertainment centre. Phone (02) 9212 6068. Open until 2am. When booking go for the 8pm sitting where you can have the table all night and try ask for a booth, if you book for the 6pm sitting you will be turfed out at 8pm. You make me hungry and jealous...travel o/s again to eat. If I go to Sydney for marking you must take me out to dinner! The absence of sparkles in your number twos is indeed disappointing! But should we be concerned- where did they go?